1. Description: Tortilla chips machine is our newly designed product based on European technology. Machinery got second level drive and easy operation characteristics. Shape maker is using roller pressing method which forms nice shapes and no wastage during the process. It is an advanced corn chips processing machinery. The biggest advantage of Tortilla chips is its cute shape and crispy tasty. Fried triangle chips consumes less oil than other fried snacks, it could save up to 30% of oil. 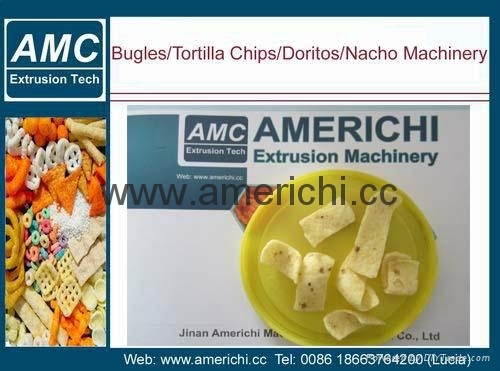 The material range of triangle chips are wide, it could use rice powder, corn powder, flour and mixed grain powder, so you can find material easily anywhere around the world. This project is another high profit but low cost project for snack food industry.